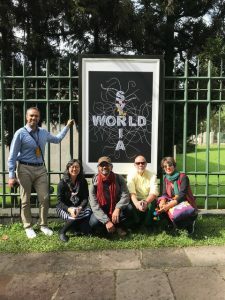 Parisa Tashakori’s design on the outside wall of anthropology museum in Xalapa during the Bienal International Cartel en México. PURPOSE: Encouraging leadership and the sharing of good practices through professional development will advance our creative economy, support professionals and businesses, and enhance cultural dialog. Professional Development Scholarships are awarded by the Office of Arts and Culture staff. Staff reviews applications and notifies applicants on the date noted below. Awards are announced at the next meeting of the Boulder Arts Commission following the notification of decision. Total funds: $17,000. Round one: $10,000. Round two: $7,000. Cycle: Annually. Opportunities must take place in the calendar year the application is submitted. Maximum Amounts for Scholarships: The costs of registration, travel and expenses up to $500 for programs which take place in Colorado, or up to $1,000 for programs that take place out-of-state, or $500 for on-line opportunities. DEADLINES: Two deadlines. These are awarded by Office of Arts and Culture staff. Staff reviews applications and awards are announced at the next meeting of the Boulder Arts Commission following the notification of decision. Professional development opportunities must take place after the grant funding decision and within the calendar year the grant is awarded. Deliberation. Proposals for Professional Development Scholarships are approved through administrative review by staff of the City of Boulder Office of Arts and Culture. Awards are announced at the next meeting of the Boulder Arts Commission following the deadline. Evaluation of applications. Staff review applications to ensure that all eligibility criteria are met before awarding scholarships and that the application fulfills the intent of the funding. Should staff receive more applications than funding allows, the Boulder Arts Commission has authorized that the Office of Arts and Culture staff will award based on the order in which the applications are received. Should there be any questions about eligibility or award decisions, staff will consult with the Arts Commission in a public meeting. To apply, log on to the Boulder Arts Commission grants software and complete the online grant application. The software is new for the Arts Commission as of Fall 2017, so you may need to make a new profile.